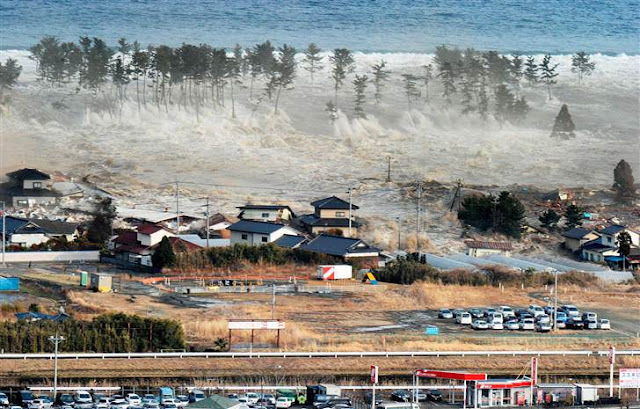 If anyone in the agility world hasn't already seen this photo of the Japanese tsunami about to engulf an agility field--well--here it is. The quake itself registered 8.9. Unimaginable. When the Loma Prieta quake hit in 1989, I was about 9 miles from its epicenter. It rocked us hard. (I previously posted about it.) Difficult to stand up or walk comfortably, although hard to know because most of us were diving under our desks or tables. The Richter Scale is logarithmic--each full number indicates a magnitude 10 times stronger. So--the Sendai quake was 100 times more powerful than Loma Prieta. Really, I can't imagine. It gives me chills. What a disaster. Consider that the largest earthquake ever recorded (on a seismograph) registered 9.5. And the largest that's likely to ever occur in California is probably around 8. The quake that devastated Haiti? 7.0. That 8.9 is really. Really. Overwhelmingly big. And seeing that tsunami sweep across the countryside towards an oh-so-familiar-feeling dog agility field--wow. Brings it all home to me, for some reason, in a way that none of the other photos can. Same here. I do agility and this photo is horribly . . . intimate. Such small things we are in this large, dangerous world. My heart goes out to Japan. I hadn't seen this photo. I keep trying not to think about the people in the cars and houses as the water sweeps through. Horrible. Unthinkable. Even after having seen the photos and video, unimaginable. The dog agility community in Colorado is trying to identify the owner of the agility field. Please pass this on as well as any information you have. @Tina: Someone in my agility circle already posted asking if anyone knew the people to whom that field likely belonged. No responses to that. As personal and disturbing as this photo is, it still looks like freakishly bad Hollywood special effects. Apparently, there is a video that shows the whole story, including the aftermath with no more agility field. I'm actively looking for a link. I've also heard that there's a vid. I don't know that I could bear to watch it, so I didn't go looking for it. The agility field probably belonged to Yuriya Kojima, who was #4 in small dog class for FCI WAO 2009 Japan team. Just in case this helps you locate affected agility competitors in the area, The Daily Beast caption for this photo reads: "A massive tsunami engulfs a residential area after a powerful earthquake in Natori, Miyagi Prefecture, northeastern Japan on March 11." So, hopefully agility people can identify other agility competitors in Natori and locate who owns this field and/or others in need because of the earthquake and tsunami. I'm emailing agility friends in Japan also and will share contacts if I find out anything. As near as i can figure out the Agility training center was located at the end of the runway 30 at Sendai airport. I based it on other video of the airport showing the wave encroaching on the airport. I'm posting some updated info in today's blog. Coming shortly. @Jamesw2: Thanks, but that link just takes me to the main google map page. To get the URL for the exact place shown on a google map, you can click the "Link" link near the upper right and it will give you the URL of exactly what you're viewing.